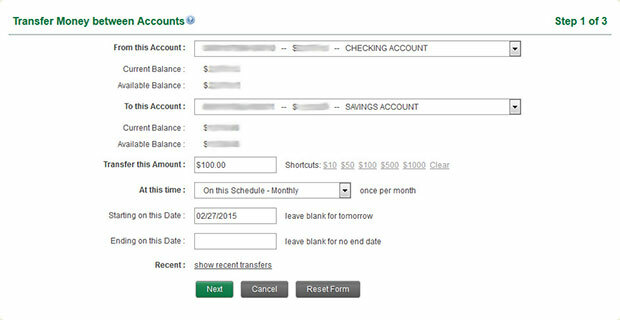 Each time a deposit is made into my checking account, is it possible to have a certain percentage of the deposit automatically transferred into my savings account? Unfortunately, there isn't an automated way to have a percentage of each deposit go to savings. However, you may set up a specific amount to transfer on a regular schedule (weekly, bi-weekly, monthly, etc.). To transfer funds among your Redwood Credit Union accounts, please use the RCU Online Banking transfer feature. Log on to Online Banking at: https://online.redwoodcu.org.